Summer is the perfect season to experience live music in Chicago—and there’s no shortage of concerts, festivals, and outdoor performances to choose from. And, as there are so many places to experience music in Chicago, there’s no reason to not get outside and take advantage of all that Chicago has to offer. From folk and classical to hip-hop and electronic, there’s a genre for everyone. Here are 5 ways to enjoy some live music this summer—get those dancing shoes ready. 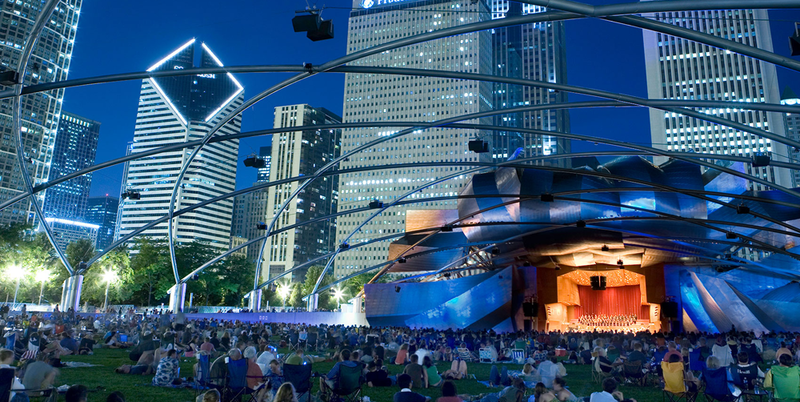 Throughout the summer, head to Millennium Park on Monday and Thursday evenings at 6:30pm for some fresh air and live music. Attracting artists, both locally and internationally, the “Summer Series” is a tradition that Chicagoans and tourists look forward to each year. Check the schedule and mark your calendars for the free performances this summer—jazz, Latin, hip-hop, classical, and folk—they have it all. There’s no larger music festival in Chicago than Lollapalooza, bringing in crowds from across the world each year in August. Chicago lights up with neon tees, crazy headpieces, and loud, energizing music—this year the can’t-miss concert will take place from August 3rd-August 6th right in Grant Park. Featuring over 100 artists, some stand-outs include The Killers, Lorde, Blink-182, Chance the Rapper, Foster the People, Muse, and more. If you’re a classical music aficionado, the Grant Park Music Festival is where you should take in some outdoor live music this summer. At Jay Pritzker Pavilion, orchestras and choruses gather to share some of Beethoven’s finest and symphonies from legendary, American composers. It’s quite a place to feel inspired and let the music enrich the soul. Whether you want to take a spot on the lawn or purchase an assigned seat, the ambience at Ravinia Festival, as well as the live tunes, will make for a memorable experience. With great artists, such as Alanis Morissette on Friday, August 25th, One Republic July 14th-15th, Aretha Franklin September 3rd, and Stevie Nicks September 9th-10th, among others, there’s a reason why this is the oldest outdoor music festival in America (one that keeps on kicking). Sure, you can take in a Cubs game at Wrigley Field in the summertime (which makes for a fun Saturday afternoon, to note), but you can also experience live, outdoor music in Chicago from some of the world’s most popular artists. This year, you can expect Billy Joel on August 11th, Green Day on August 24th, and even Lady Gaga on August 25th. What’s more, the same goes for Soldier Field, home to the Chicago Bears—Coldplay will be there August 17th!